The legal implementation of the Trade Related Aspects of Intellectual Property Rights (TRIPS) agreement (and the challenges it raised in terms of expertise and process of translation) is only a small aspect of what needs to be looked at in order to understand the effects of TRIPS and of patents as a source of formal regulation in Djibouti and Ghana. If understanding legal regulations as part of broader processes of social ordering, and as having ordering as one of the very aims of legal regulations, the next level of inquiry should question how TRIPS has transformed or is transforming local relationships and how pharmaceutical patents influence behaviour and practices. The significance of TRIPS on healthcare in specific localities is dependent on its ability, and of the ability of intellectual property (IP) regulations more broadly, to shape specific networks; in particular, the effect of pharmaceutical patents in general is codependent on their ability to ensure that drugs in breach of international standards of patents remain excluded from the territory concerned. And this implies that those importing drugs are aware of the rules and made to obey them. 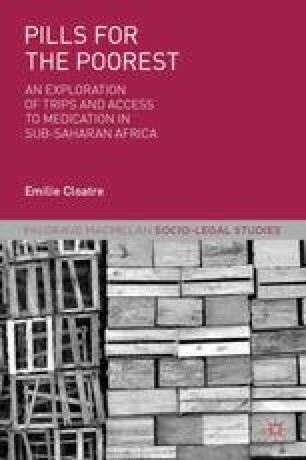 In order to understand the potential and actual effect of rules relating to pharmaceutical patents on social ordering in Ghana and Djibouti, it is thus essential to move away from the networks of IP stricto sensu and explore how TRIPS affects practices and behaviour in other offices. In both case studies, the picture emerging from this further investigation is one in which the limits and weaknesses of IP as a set of legal prescriptions are apparent and are a constitutive part of the system.